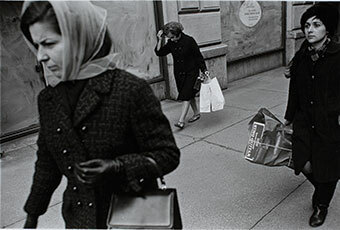 Jonathan Brand (American, born 1933), Garry Winogrand, New York, 1967 (negative); 2002 (print), gelatin silver print, Gift of the artist, © Jonathan Brand. Jonathan Brand, (American, born 1933), 57th Street, New York City, 1967, Gelatin silver print, Gift of the artist, © Jonathan Brand. Garry Winogrand, one of the foremost American street photographers of his generation, worked with a fast gait and even faster shutter. 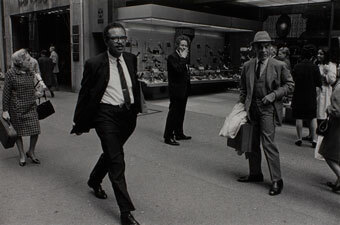 In the 1960s, successful Lexington Avenue copywriter and ardent photographer Jonathan Brand kept pace with Winogrand during regular lunchtime shoots on the streets of Manhattan. Two-Way Street charts the friendship between the two men, revealing their complementary subject matter, working methods, and aesthetic styles. Featuring selections from Winogrand’s important portfolio Women are Beautiful and photographs spanning Brand’s five-decade oeuvre, the exhibition demonstrates their shared appreciation of the female subject. Two-Way Street also highlights rarely seen materials such as 35mm contact sheets of shots made during joint excursions, rare prints that Winogrand gave to Brand, and never-before-exhibited photographs of Winogrand at work and rest. Though photographers are often cast as loners, Two-Way Street demonstrates the meaningful intellectual and aesthetic connections made through this artistic friendship.